Ptolemy II Philadelphus (“brotherly” or “Brother/Sister-loving”), was the second ruler of the Ptolemaic Dynasty and the son of Ptolemy I and Berenice I who died before 283 BC. He became joint ruler with his father two years before his death in 283 BC. Ptolemy II carried on his father passion for expanding and building theGreat Library at Alexandria. His construction efforts also included the building the canal that linked the Nile to the Gulf of Suez. Ptolemy II was married at first to Arsinoe I (282-247 BC), daughter of Lysimachosof Thrace in a political arrangement by his father to insure peace and build support in circa 288 BC. Arsinoe I was the mother of Ptolemy III, Their daughter, Berenike, was married to Antiochus II of Syria also in a political marraige to establish stability. Ptolemy II was engaged in a series of wars with the Seleucid king Antiochus I. It was through this effort that Egypt became the dominant maritime power in the eastern Mediterranean Sea. About 278 BC, a few years after the defeat of his wife’s father Lysimachos, Ptolemy II accused Arsinoe I of complicity in a plot against his life and banished her to Coptos, in Upper Egypt. Shortly thereafter, Ptolemy II married his sister,Arsinoe II, who had previously been married to King Lysimachus, father of his first wife. Thus began a tradition that marked the Ptolemaic Dynasty of brother-sister relationships. 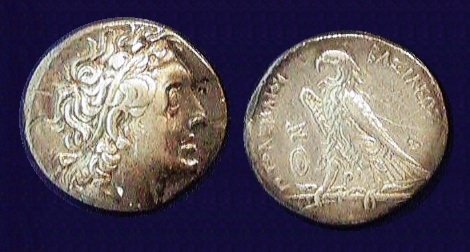 Upon the death of Arsinoe II in 270 BC, Ptolemy II had her deified and built a shine in Alexanderia in her honor and issued postumous coinage, which was continued by later successors. Ptolemy II also began a four-yearly celebration to honor his father which also lasted several hunred years. Ptolemy II intended that this celebration of his father would have the status equal to the Olympic games. 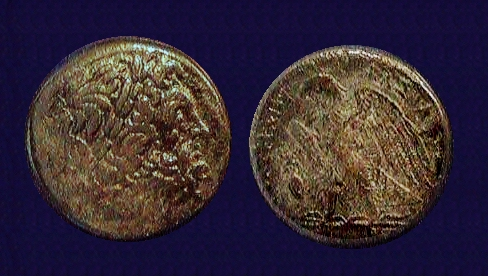 He also began a long-standing tradition of maintaining his father’s portrait on a large portion of the coinage which also continued into the reign of the last Ptolemaic rulers – Cleopatra VII. Ptolemy II Philadelphus ruled a stable and prosperous kingdom until his death in 246 BC. His passion to enlarged the library at Alexandria transformed his city into a world center of knowledge that matched that of Athens in the age of Perikles. He sent agents abroad to buy or copy books. Every ship that entered Alexandria was searched for books which were either purchased or copied and returned. Under Ptolemy II, the library was expanded to half a million scrolls or books. According to the “Letter of Aristeas”, Ptolemy II requested 70 Jewish scholars from Jerusalem to translate the Pentateuch into a Greek version that was placed into the Great Library collection. The Greek poets Callimachus and Theocritus were among the literary figures connected with the court of Ptolemy II as Alexandria emerged as the great learning center of the ancient Hellenistic world. Ptolemy II died on January 29th, 246 BC. He was succeeded by his very capable son, Ptolemy III.